The Axons attempt to convince Jo she suffered a hallucination due to being near their power source. Chinn negotiates with Axos for worldwide distribution rights for Axonite and then, using emergency powers granted to him by the minister, has all Unit staff arrested. The Doctor is released to aid Windsor in his testing of the Axonite. The Axons duplicate Bill Filer and send him to fetch the Doctor. The Master negotiates his release, but Axos retains his Tardis. He journeys to London to bring the Doctor's Tardis back with him. Filer escapes and saves the Doctor from the fake Filer but in doing so is arrested and locked up with Unit. The Doctor runs an experiment on the Axonite which Windsor interferes with and is killed, setting off an alarm that allows the Brigadier, Jo & Filer to escape. The Doctor realises Axos, the Axons & Axonite are all one being. The Axonite sample is absorbing all the energy from the nuclear power plant and duplicating itself. The Doctor & Jo are surrounded by tentacled Axon monsters. Must resist urge to punch Chinn..... Deary me one self seeking idiot fouling it up for the whole world. Windsor's a bit of an idiot too for someone who's supposedly the chief scientist at a power point as the manner of his death demonstrates. Actually what function is Filer playing in this story that couldn't have been filled by giving his part to Captain Yates? Hmmm. We liked the Axon eye on a stem that talks to the Master, a decent effect unfortunately flawed by some dodgy CSO that causes the background to be seen through it occasionally. Lots of the cast in this story are familiar to us from Doctor Who and other television programs. Donald Hewlett,playing Hardiman, becomes a regular player in Croft & Perry sitcoms appearing as Colonel Charles Reynolds in It Ain't Half Hot Mum and Lord Meldrum in You Rang, M'Lord?. David Savile, Winser, already has played Lieutenant Carstairs in The War Games and returns as Colonel Charles Crichton in The Five Doctors. Bernard Holley is the golden Axon Man and he was previously Peter Haydon in The Tomb of the Cybermen. The Axon Boy, John Hicks, was a Quark in The Dominators while one of the Radar operators, Michael Walker will return as Miseus in The Time Monster. This is the television debut for Tim Piggott-Smith, playing Captain Harker, who'll return as Marco in The Masque of Mandragora. He's been in a large number of prominent TV and film productions. Bill Filer is played by Paul Grist who's also been in genre shows such as Blake's 7: Gambit as Cevedic and Survivors. 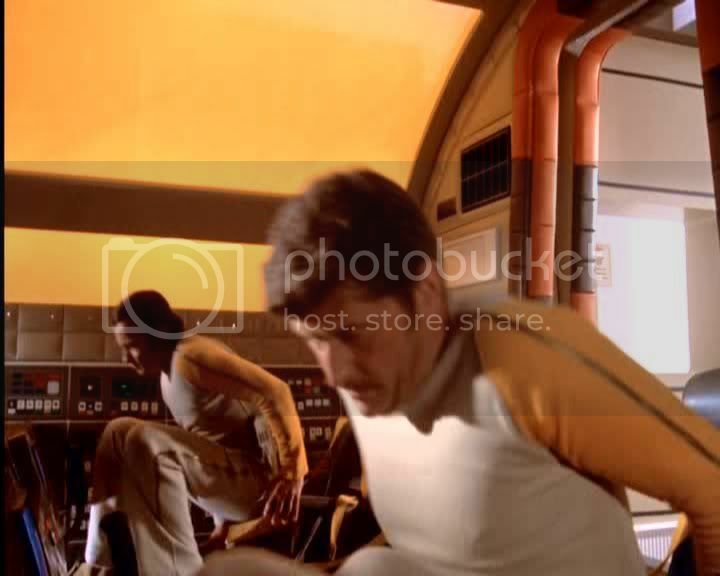 An online acquaintance of mine believes they've spotted him in Space 1999 as an Eagle Pilot. This is Michael Fergusson's fourth and final Doctor Who story following The War Machines, The Seeds of Death & The Ambassadors of Death. This story exists as 625 line PAL video for episodes 1 & 4 and 525 line video for episode 2 & 3 which was subjected to the Reverse Standards Conversion Process to bring it back close to the original look of the episode on it's UK broadcast.